Appearances aren’t everything – this corrugated iron shed hides a real treasure. Wentworth Mine, Lucknow – a surprising treasure. Travelling to Orange on the Mitchell Highway, one might just miss Lucknow, thinking the 50 km an hour limit is a brief inconvenience. The two surviving poppet heads in this small settlement, just 10 kms on the Sydney side of Orange, tell of a different past, when the ground gave up its treasures of gold. But that’s not the only treasure to be found. In a project jointly funded by Orange City Council and the Heritage Branch of NSW, the Wentworth Mine is being conserved and re-opened to the public. One of the galvanised iron sheds hides an almost complete stamper battery, together with all its gold processing equipment, just as if the miners left yesterday, instead of 60 years ago. This is one of only a handfull of stamper batteries in Australia that survive in good condition. 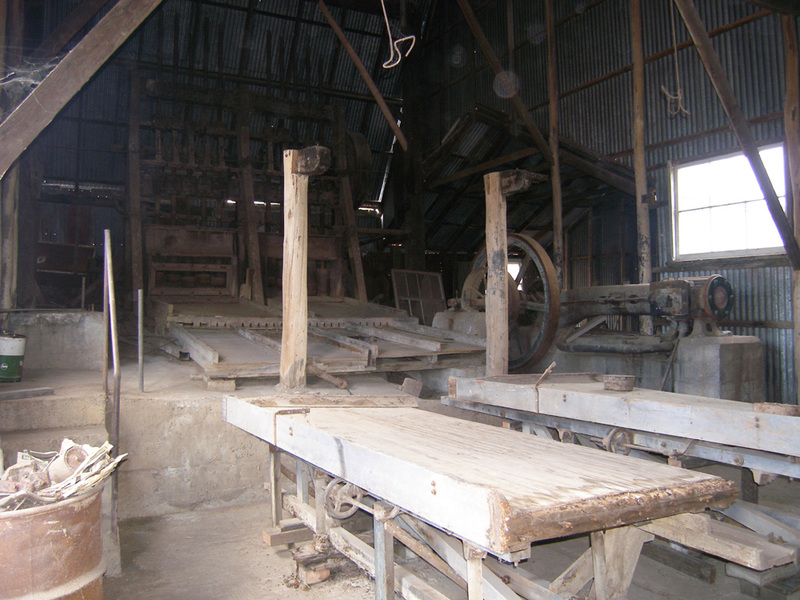 EHA recently assisted Council in the reconstruction of the Wilfley or shaking tables, which were used to extract the last grains of gold from the ores. From the stamper battery, the crushed ore passed over a first set of tables. Mixed with mercury, much of the ore would be precipitated for separate processing, but larger particles passed onto the second set of Wilfley tables, made of timber with surfaces clad in canvas, where the gold would be collected. Failing this, gravity separation was used as a third method of retrieving the gold, in galvanised iron tanks. This ore would finally be treated with cyanide to separate the gold. While the stamper battery shed has been used for later farming purposes, much of the equipment was left where it stood. The Wilfley tables had been dismantled and moved into a corner. Although partly damaged, it was these tables that were put back in their original position in 2009, supported on a simple timber frame, so that their weight was taken off the fragile timber legs that had allowed the tables to shake or sway back and forth during processing. The works were originally powered by a simple horizontal steam engine, most of which is still intact. The Wentworth Mine tells the story of goldmining in the Central West, from its beginnings in the 1850s, through three stages, until closure in the 1950s. Edward Higginbotham & Associates Pty Ltd. 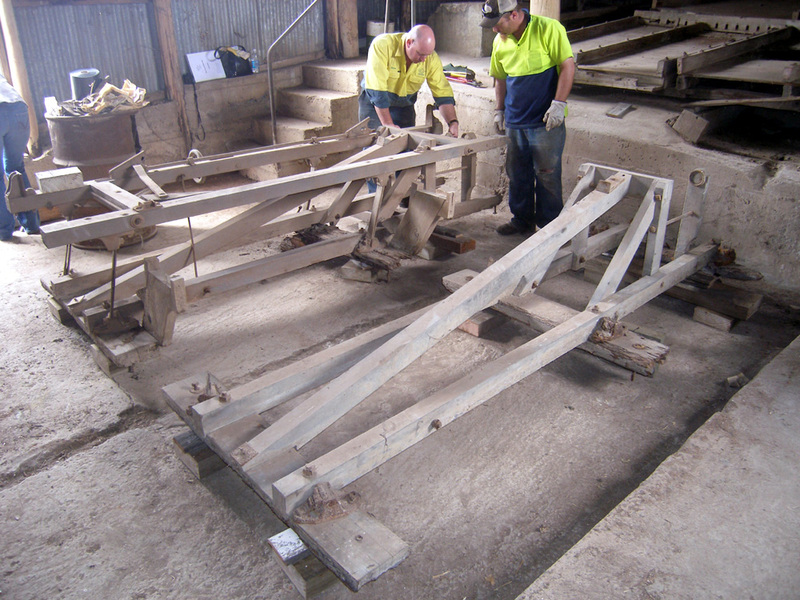 Partial reconstruction of the Wilfley tables, the Stamper Battery Shed, Wentworth Mine, Mitchell Highway (corner of Emu Swamp Road), Lucknow, NSW. Orange City Council, 16 February 2009. The Wilfley tables in the process of reconstruction. The task completed – with the Wilfley tables finally in position, the process of gold recovery can be clearly understood.The 10-head stamper battery looms at the back of the shed, with the first set of amalgamation tables leading the residues onto the Wilfley tables in the foreground, all powered by the steam engine on the right.